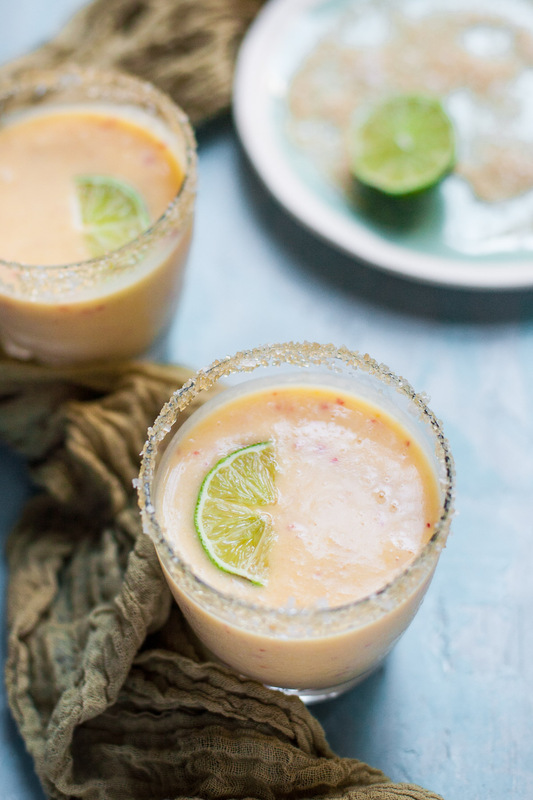 These creamy, frozen pineapple peach margaritas are just the thing for hot summer evenings. Somehow a whole month has passed without me sharing a recipe, and it’s felt like no time at all! I didn’t intend to take such a break, and I’ve been sitting on these scrumptious margaritas for quite some time, but one thing after another kept piling up. 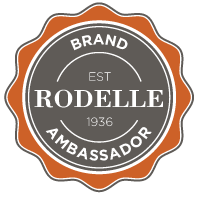 I’ve been hard at work on some exciting freelance projects that I can’t wait to tell you about as soon as I’m able! For today, though, I’m offering a simple, sweet, and creamy libation. 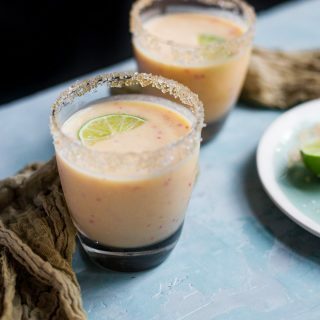 These pineapple peach margaritas are made with ripe summer peach, frozen pineapple, fresh-squeezed orange and lime juice, and a splash of cream or coconut milk. I like a mix of sea salt and raw sugar for the rim, which helps strike an ideal and refreshing balance between sweet and salty tastes. 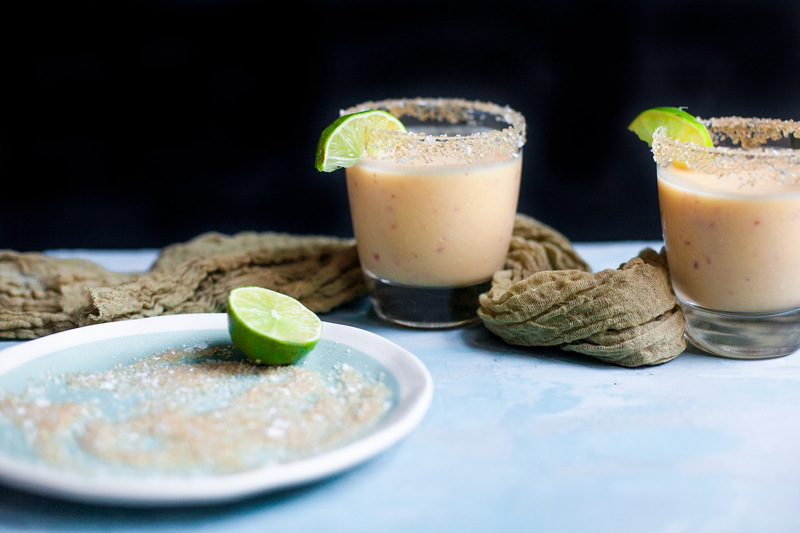 This recipe is a corollary of the fresh peach margaritas I shared on Instagram last year. They’re both equally amazing, so if you really want to highlight amazing peaches or don’t have any pineapple on hand you’ve got options. The all-peach version is served on the rocks and the pineapple peach version is frozen. I would be hard pressed to pick a favorite! 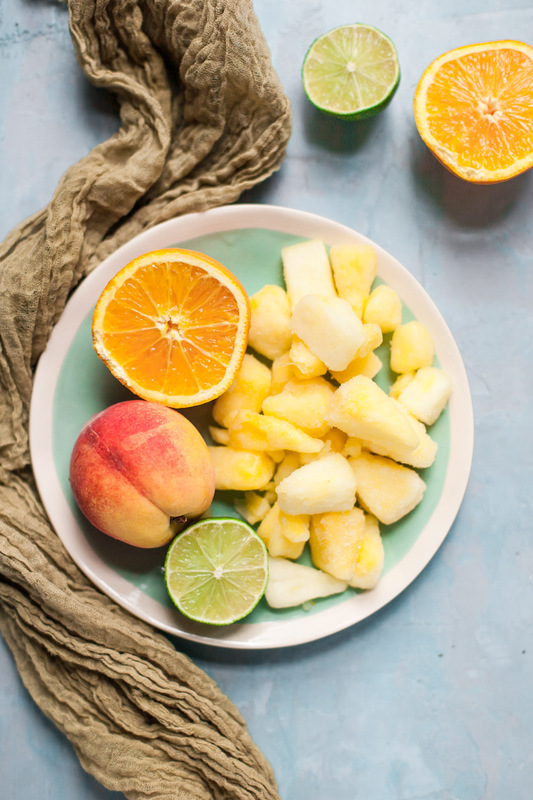 I hope your summer has included many fresh fruits and refreshing drinks like these, and that you’ll get your hands on more of both in the weeks to come! Cheers to summer! If you’re looking for more warm-weather cocktails, may I suggest grapefruit jalapeño margaritas, strawberry prosecco lemonade, or a non-alcoholic watermelon raspberry agua fresca? Scatter the salt and sugar on a small plate. 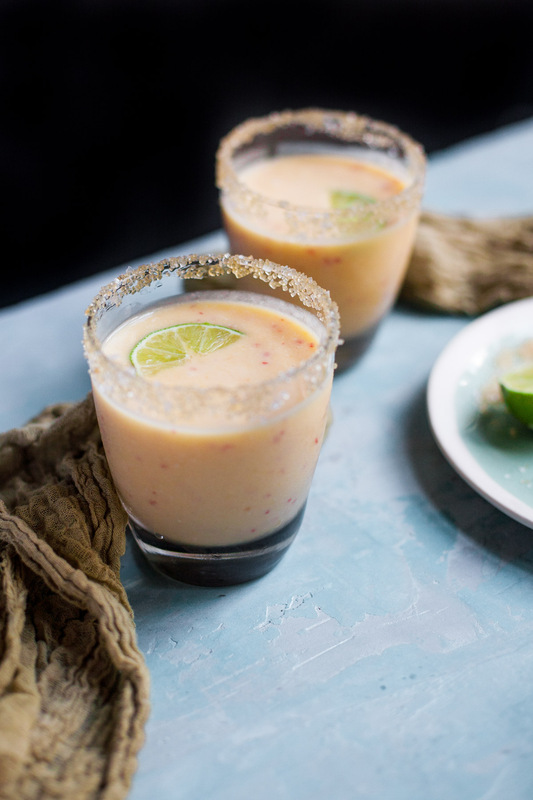 Rub a lime slice along the edge of each glass, then dip and roll it in the salty-sweet mixture to coat the rim. 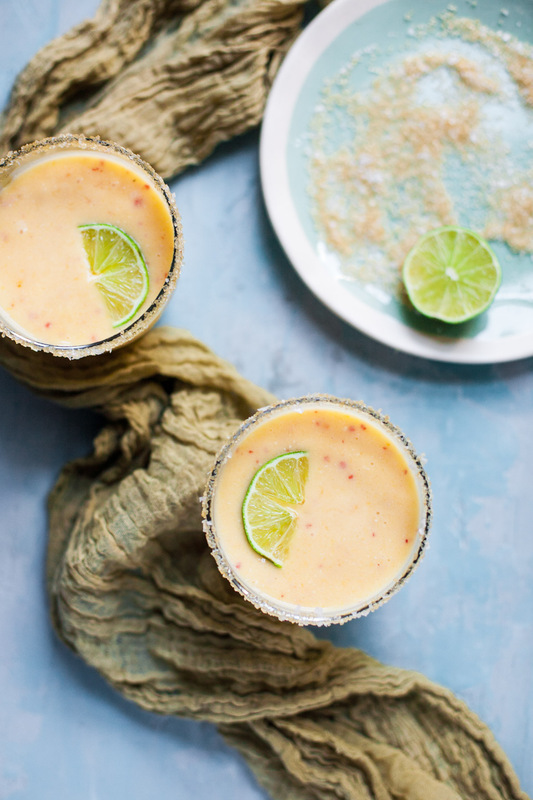 Combine all the margarita ingredients in a blender and process until smooth. Taste and add additional honey (or tequila!) if desired. Divide between the two glasses, garnish with lime wedges, and serve. Oh….I think I need one of these right now! Stress level through the roof = margarita needed STAT. I feel the same way, Mary! Thank you so much, Medha! I haven’t tried that but will definitely look for it!